Wow, can you believe it.....April 1st! Yikes, does the time seem to by flying by or is it just my imagination? They say the older you get the faster thing seem...I am beginning to feel that way. Come on, slow down, lol ! I made a fun card (I hope you think it's fun) for my nephew who loves hanging out at the beach and/or pools in the summer. He loves the water and has all these fun pool toys. The beach balls, snorkeling, scuba diving rings, goggles, flippers etc for summer fun. I will be adding a little gift card to the inside so he can go buy a couple new things for the pool. I hope he likes it! This card base is 5 x 5 and the base layer at 4 3/4 x 4 3/4. I cut cute Elmo and the layers at 4 12/ plus the layers from the Sesame Street Season's cartridge. I added a small strip of yellow that is 1 1/2 x 5 which I embossed with the dots folder along with a border using a SU border punch. The circle and scalloped circle are from a SU punch and the sentiment is from Pink by Design ~Vacation set. I added some fun bling around the sentiment, a couple little buttons and a little bow to finish the card. Be sure to stop by Go Fish Challenge Blog and check out what the amazing Design Team has created. 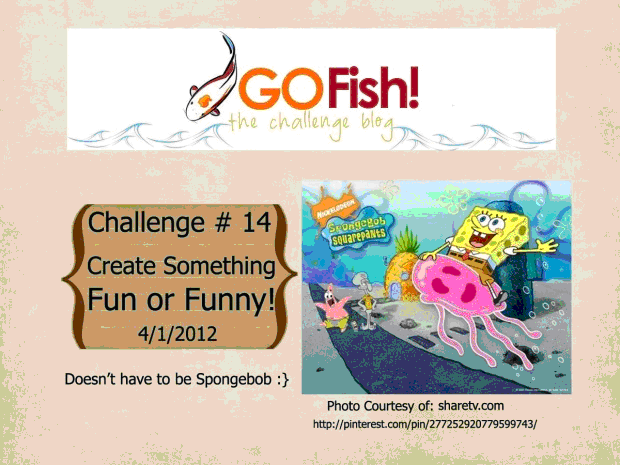 Hope you come and join us in the FUN of FUNNY challenge:) Can't wait to see what you create! Ohhhhhh Elmo's my FAVE!!! I loveeeeeeeeeeee this!! Tooooooooo cute! Very Fun Card. To tell you the truth I was completely stumped with our challenge too and I came up with it, LOL. Your Nephew is going to love his Elmo card. Super cute, puts a smile on my face. TFS! This is so cute Sherrie.Great sentiment and Love Elmo. Such a bright and fun card. This is so cute I think your nephew will love it. This really is a fun card - and I'm sure your beach-loving nephew will be delighted with it! It made me smile! I can't believe it's April! We woke up to a fair bit of snow. I'm not impressed with Mother Nature's trick on us!! This is a fun card!! Elmo is so cute and I'm sure your nephew will love it! im sure your nephew will love it! it's so cute and fun! This is adorable!!!! Love Elmo and such a great sentiment! I agree the older I get the faster time goes! Think your brain defrosted perfectly nothing more fun that elmo! red and yellow perfect! super cute card.love the colors.fun cheerful card. Sherry this is so great :) Love it turned out :) Soooo fun! Aww Sherrie! This is such a fun and sprightly card, perfect for the challenge! :o) Elmo looks amazing and I love the sparklified fun sentiment. The ribbon is gorgeous and your button accents are amazing. I LOVE how you always coordinate everything flawlessly.. so many circles throughout this sweet card. :o) Beautifully done, my sweet friend! What a super fun card! I love that Elmo cut and the sentiment is too cute!